A growing number of hemp companies are launching products aimed at the tattoo industry, from CBD patches marketed as pain relief to balms and creams designed to speed recovery, to expand their retail opportunities. 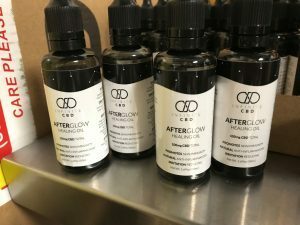 “A tattoo, it’s basically just an open wound,” said Ali Munk, spokeswoman for Infinite CBD, a Denver company that makes hemp-derived CBD isolate and recently started selling two tattoo-related products – an antiseptic wash for use before the tattoo and a healing oil for use after. The trend comes as CBD producers look for nonmarijuana retail opportunities amid ongoing legal uncertainty about cannabis’ legal status. Tattoo products give the CBD and hemp industries a safer retail environment and the potential for attracting new cannabis users who may not be shopping in dispensaries because they don’t use marijuana. “I don’t want my product to be confused with a THC product; I want my product to sell nationally,” said Colleen Kibler, creator of Nurse Mary J, a hemp-oil lotion she developed in Houston and sold out of her car to tattoo shops and aficionados at tattoo shows. Kibler was a passionate tattoo fan who was unhappy with common tattoo aftercare products derived from petroleum. When she started reading about cannabidiol in 2014, she saw a new business opportunity. “I recognized immediately that CBD is perfect for tattoos,” said Kibler, who sells her lotion for $20 for 4 ounces. Kibler started selling her tattoo lotions in 2016 and hasn’t been able to keep up with demand. According to market research firm IBISWorld, the U.S. tattoo industry is worth $1.6 billion a year, a figure that includes tattoo services and ancillary products such as aftercare and maintenance products. “CBD knocks out a lot of the inflammatory cells,” said Dr. Jeanette Jacknin, a San Diego dermatologist who recently gave the first-ever talk on cannabidiol to a meeting of the American Academy of Dermatology. No data exists to show how many tattoo recipients also use cannabis. But several CBD producers interviewed by Marijuana Business Daily said they created tattoo products after seeing their own staff members use hemp balms on their tattoos. Mobius Beverage, a Seattle company that makes fruit juices infused with THC, started making CBD-infused skin patches and lotions this month after founder Bruce Milligan used a hemp topical on his own tattoo. “I’d already been using formulations of CBDs and butters for skin care, so of course I used it when I got my tattoo” in 2017, Milligan said. “All my friends and associates couldn’t believe there was so little redness and scaling,” he added. There’s “huge potential” for such products overseas as well, according to Tony Calamita, founder of Love Hemp. The London company makes CBD oil sprays and tinctures and is working on a product aimed at tattoo recipients. “I got my first tattoo four or five months ago, and when I was looking at the aftercare products, I wasn’t pleased,” Calamita said. “I thought for sure there would be a big market here for putting CBD into standard tattoo formulation. Calamita and hemp producers in the United States are hoping the tattoo market represents a toehold into the larger wound-recovery market. That’s because tattoo artists are more receptive than many pharmacists to carrying cannabis-derived products. “When you walk into a tattoo shop and say, ‘This reduces heal time,’ they’re totally open to it,” Infinite CBD’s Munk said. “They know what CBD is, and they’re so open-minded. They don’t have to go through as many hoops to get products on the shelves. And tattoo shops have an advantage over marijuana dispensaries, Nurse Mary J’s Kibler said. “Let’s say 100 people walk into a dispensary,” she said. “Some of them might be interested in getting a tattoo, but who knows how many. Can CBD use for eczema skin to reduce itchiness? My company has been making tattoo inks for over 30 years and is one of the first in the USA to manufacture tattoo inks. I have been doing my homework on the THC free CBD benefits and decided to infuse it into our new line of tattoo ink. WOW my tattoos healed quicker and cleaner with half the pain as our other lines of ink! Colors are bold and beautiful and all the artist are saying is that “it goes in like butter” making it easier and quicker without all the packing normally needed to achieve their goals. We make sure our hemp oils are from reputable companies and grown without pesticides making for a clean hemp product! There is NO THC in the inks as this is not needed to achieve the results of a better way of getting a tattoo and enjoying it a little more without the long healing time as of the normal inks! How funny that I’m looking into better ways to utilize my CBD when there you are!